Viral Rash. Most rashes are part of a viral illness. Viral rashes usually have small pink spots. They occur on both sides of the chest, stomach and back. Your child may also have a fever with some diarrhea or cold symptoms. They last 2 or 3 days. More common in the summer. Roseola. This is the most common viral rash in the first 3 years of life. (See details below). Scarlet Fever. Scarlet Fever is a speckled, red rash all over. Caused by the Strep bacteria. Starts on upper chest and quickly spreads to lower chest and stomach. No more serious than a Strep throat infection without a rash. Heat Rash. A fine pink rash caused by overheating. Mainly involves neck, chest and upper back. Insect Bites. Insect bites cause small red bumps. Flying insects can cause many bumps on exposed skin. Non-flying insects are more likely to cause localized bumps. Hot Tub Rash. Causes small red bumps that are painful and itchy. Mainly occurs on skin covered by a bathing suit. Rash starts 12-48 hours after being in hot tub. Caused by overgrowth of bacteria in hot tubs. Petechiae Rash (Serious). Petechiae are purple or dark red colored tiny dots. They come from bleeding into the skin. Scattered petechiae with a fever are caused by Meningococcemia until proven otherwise. This is a life-threatening bacterial infection of the bloodstream. Peak age is 3 to 6 months old. Unlike most pink rashes, petechiae don't fade when pressed on. 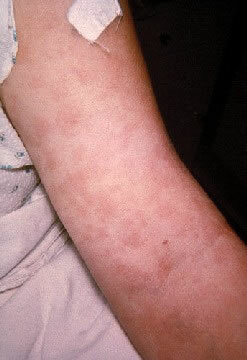 Purpura Rash (Serious). Purpura means bleeding into the skin. It looks like purple or dark red larger spots. Widespread purpura is always an emergency. It can be caused by a bacterial bloodstream infection. 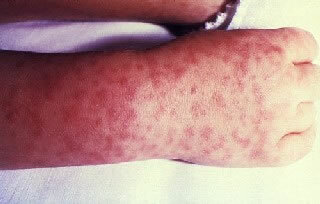 Rocky Mountain Spotted Fever is an example. Blister Rash (Serious). Widespread blisters on the skin are a serious sign. It can be caused by infections or drugs. Stevens Johnson Syndrome is an example. Caution. All widespread rashes with fever need to be seen. They need to be diagnosed. Reason: some serious infections that can cause this type of rash. Prescription medicines sometimes cause widespread rashes. Some are allergic, but most are not. Non-prescription (OTC) medicines rarely cause any rashes. Most rashes that occur while taking an OTC medicine are viral rashes. Fever medicines (acetaminophen and ibuprofen) cause the most needless worry. Reason: most viral rashes start with a fever. Hence, the child is taking a fever medicine when the rash starts. Drug rashes can't be diagnosed over the phone. Most children get Roseola between 6 months and 3 years of age. Rash: pink, small, flat spots on the chest and stomach. Then spreads to the face. Classic feature: 2 or 3 days of high fever without a rash or other symptoms. The rash starts 12 to 24 hours after the fever goes away. The rash lasts 1 to 3 days. By the time the rash appears, the child feels fine. Treatment: the rash is harmless. Creams or medicines are not needed. 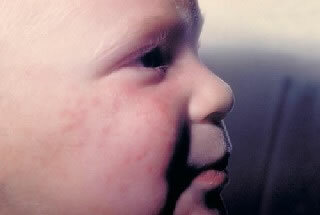 Widespread means the rash occurs on larger areas. Examples are both legs or the entire back. Widespread can also mean on most of the body surface. Widespread rashes always occur on matching (both) sides of the body. Many viral rashes are on the chest, stomach and back. The cause of a widespread rash usually spreads through the blood stream. Examples are rashes caused by viruses, bacteria, toxins, and food or drug allergies. Widespread rash, but none of the symptoms above. Reason: all widespread rashes need to be checked by a doctor. Most rashes with small pink spots all over are part of a viral illness. This is more likely if your child has a fever. Other symptoms (like diarrhea) also point to a viral rash. If you suspect a heat rash, give a cool bath. Otherwise, no treatment is needed. Wash the skin once with soap to remove any irritants. Steroid Cream. For relief of itching, use 1% hydrocortisone cream (such as Cortaid). Put it on the most itchy areas. No prescription is needed. Do this 3 times per day. Cool Bath. For flare-ups of itching, give your child a cool bath. Do not use soap. Do this for 10 minutes. (Caution: Avoid any chill). Option: Can add 2 ounces (60 mL) of baking soda per tub. Most viral rashes can be spread to others (especially if a fever is present). If your child has a fever, avoid contact with other children. Also, avoid pregnant women until a diagnosis is made. For minor rashes, your child can return after the fever is gone. For major rashes, your child can return to school after the rash is gone. If your doctor has given medical clearance, your child can return sooner. Most viral rashes go away within 48 hours. 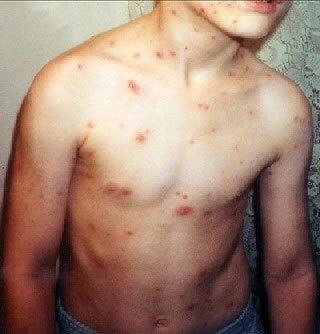 The Chickenpox rash can occur on all body surfaces. The rash is no longer contagious when all of the spots are crusted over and no new spots are appearing. This usually takes 7 days from the first appearance of the rash. This child's right hand and wrist displays the characteristic spotted rash of Rocky Mountain spotted fever. Rocky Mountain spotted fever is the most severe and most frequently reported rickettsial illness in the United States. The disease is caused by the bacteria Rickettsia rickettsii. The disease is spread by ticks. 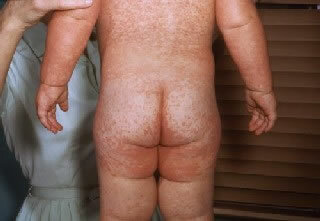 This child with measles is showing the typical red blotchy rash on his buttocks and back during the 3rd day of the rash. Measles is an acute, highly contagious viral disease. Symptoms include fever, conjunctivitis (red eyes), runny nose, cough, and spots on the inside cheeks. A red blotchy rash appears around day 3 of the illness, first on the face, and then becoming generalized. This patient had a widespread rash from an allergy to penicillin. The picture shows the arm. This is a simple viral rash in a healthy young boy. The rash was caused by the Echovirus. 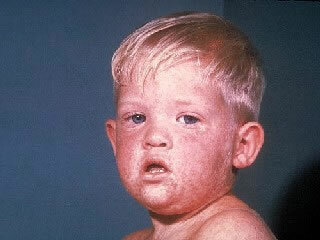 This photo shows a child with Measles. Measles is an acute, highly contagious viral disease. Symptoms include fever, conjunctivitis (red eyes), runny nose, cough, and spots on the inside cheeks (inside of mouth). A red blotchy rash appears around day 3 of the illness, first on the face, and then becoming more widespread. Chickenpox is an infectious disease caused by the varicella-zoster virus resulting in an itchy blister-like rash, tiredness and fever. It appears first on the trunk and face, but can spread over the entire body causing between 250 and 500 itchy blisters.